The Rabbinical Congress for Peace (RCP) comprised of over 350 leading rabbis in Israel and 850 abroad has sent a message through a personal contact to President-elect Barack Obama congratulating him on his election and at the same time reminded him of his prayer at the Western Wall and the biblical promise of Jewish sovereignty in the entire Land of Israel. 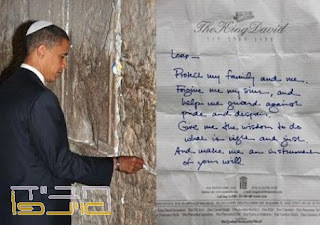 The RCP wrote that "we appreciate the fact that on your last visit to Israel you prayed to G-d at the Western Wall in Jerusalem, the holiest Jewish site, and according to media the following was the text of your prayer: "Lord-Protect my family and me. Forgive me my sins, and help me guard against pride and despair. Give me the wisdom to do what is right and just. And make me an instrument of your will." "Consistent with your focus on the will of G-d we trust that you are aware of the will of G-d when it comes to Jewish sovereignty in the entire Land of Israel. We therefore trust that you will accord the will of G-d concerning all of Israel the same divine importance as you do with regard to other areas of the will of G-d.
"The last 15 years have proven without a shadow of a doubt that the "land for peace" formula, besides being a formula that goes against the Divine will, is ineffective, obsolete, and an exercise in futility. Most of all it is a dangerous policy that only leads to bloodshed and instability in the region. "Its proponents turn a blind eye to the inescapable reality that to this day the Palestinians are cynically trampling on every promise they has ever made. Instead, they blandish with unfounded fantasies of peace. "As rabbis, we love peace and pray for peace. Moreover, we are obligated, by teaching our holy Torah, to guide our people to strive for peace – but a peace that is true and lasting. As most residents of Israel have personally witnessed, the ceding of territory inevitably invites increased terrorist activity. Silence on our part, in a question of life or death, would therefore be sinful and irresponsible. "The ruling of Jewish law which is summarized in the enclosed document forbidding the surrender of any part of our Holy Land to Israel’s neighbors is based on the principle of Pikuach Nefesh, the obligation to safeguard lives that are in jeopardy. This ruling was issued by the majority of the most prominent rabbis in Israel and abroad, among them former justices of Israel's Supreme Rabbinical Court. "This ruling is anchored in G-d's eternal Torah, whose ethical standards underlie Western civilization. We are therefore confident that you, Mr. President-elect, who prayed to be an instrument of G-d and G-d accepted your prayer, will now do everything in your power to implement the will of G-d that the Promised Land that He expressly allocated to the Jewish People will remain under Jewish sovereignty. The letter was signed by Rabbi Joseph Gerlitzky, Chairman of the RCP and Rabbi Avrohom Shmuel Lewin, Director.